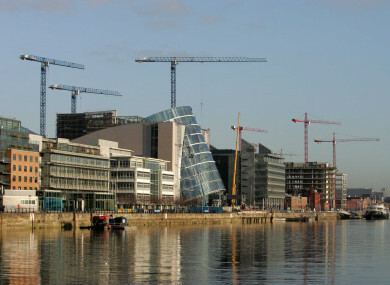 IRELAND HAS EMERGED from the ‘lost decade’ that followed the property crash as domestic spending has returned to its previous 2007 peak, according to Goodbody stockbroker. According to its quarterly Irish Economy Health Check, the Irish economy will reach full employment by the end of next year, as rapid growth in construction and consumer spending push core domestic demand beyond previous forecasts. With jobs growing at the fastest pace since 1999, unemployment will fall to just 5% in late 2018, according to Goodbody chief economist Dermot O’Leary. The stockbroker said that as a result, Ireland may need to start relying on immigrant labour to maintain its momentum as one of Europe’s fastest-growing economies. Goodbody has raised its forecasts for core domestic demand in 2017 (4.5% from 3.7%) and 2018 (4.3% from 3.6%) as domestic spending returns to its previous 2007 peak, ending what it described as “the lost decade that followed the property crash”. However, O’Leary said capacity constraints are becoming visible, especially in housing and infrastructure, meaning that governing will have to prioritise capital spending in the coming years. Email “Ireland's 'lost decade' ends as domestic spending returns to Celtic Tiger peak”. Feedback on “Ireland's 'lost decade' ends as domestic spending returns to Celtic Tiger peak”.